Join us as we celebrate Shabbat as a community in the beautiful environment of our nearby wonder of the world, Niagara Falls. The camaraderie and togetherness that can be found when spending a weekend together cannot be beat - don't miss this historic event for the KW Jewish community! 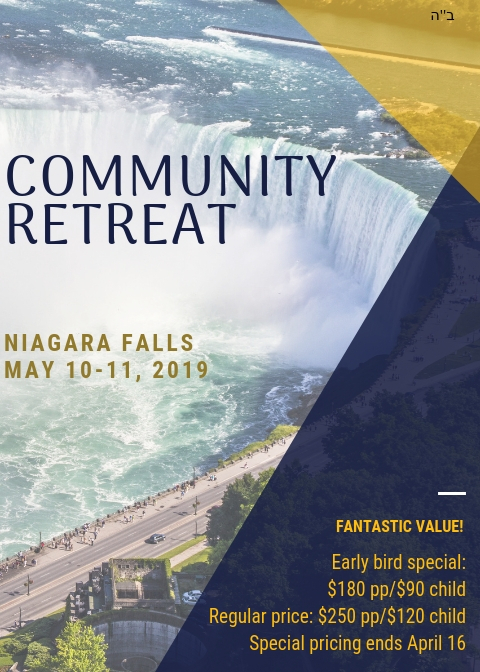 The community retreat will be held on May 10-11, 2019 in Niagara Falls, Ontario, at the Four Points by Sheraton hotel and the Chabad Welcome Centre. Early bird special until April 16 - $180 per adult, $90 per child. You absolutely cannot find a better deal at the Falls! After April 16, the cost is $250 per adult and $120 per child. 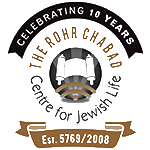 - delicious, catered Glatt Kosher meals, all hosted at Chabad Niagara, directly across the street from the hotel. From Friday afternoon through Sunday morning, your dining is included. - engaging and meaningful Shul services and lectures, including a guest scholar in residence.